Joseph Devine, president of Jefferson — NJ, talks with some of his staff. The shooting last month at a Chicago hospital that left an ER doctor, pharmacy resident, and police officer dead was a shock to our collective consciousness. Hospitals, after all, are places of healing, not of harm. A sense of sadness came over me as I read this horrible story because I actually know, firsthand, what those hospital workers were feeling. I’d felt it myself, more than once. One of our three Jefferson Health hospitals in New Jersey (then Kennedy Health) was the scene of a fatal shooting four years ago; in February of this year, a fatal shooting took place within our subacute rehabilitation facility. Like the Chicago Mercy Hospital incident, both shootings were categorized as “domestic violence” and both involved the spouses of longtime patients who entered the building with one goal: to kill their partners and themselves. Domestic violence is a tragic reality. In fact, a 2016 study by Everytown for Gun Safety showed that 54 percent of mass shootings involve intimate partners or family members as victims. “Lucky” is a relative term, but I do consider our staff and patients lucky that the shooters did not turn their rage toward visitors and patients in our buildings. For whatever reasons, they chose our facilities to carry out these acts — a gross violation of our mission to provide a safe and healing environment. 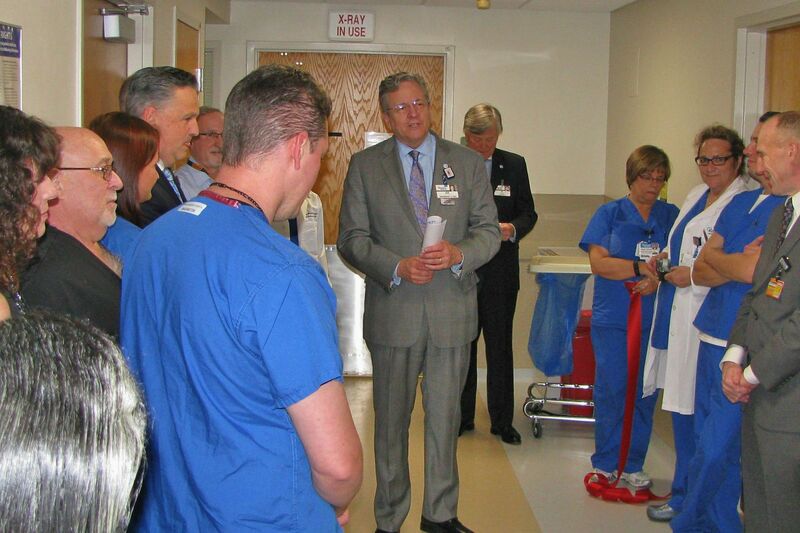 For hospitals and health-care organizations, the safety of our patients is priority one. This is not marketing jargon. While we are talking about safety efforts related to infections and falls, for example, the unfortunate reality is that security and protection from those seeking to do harm is now part of the standard of care. Today, we conduct regular, on-site “active shooter” drills to prepare staff on how to react in the event of a shooting, and we mandate annual active shooter online training for all employees. We believe preparedness is key, and we act on it. If I could speak to those at Mercy Hospital, or others affected by such tragedy, there are several things I would highlight to help move the organization forward. First, we are living in a different world from decades ago. Mass shootings have become mind-numbingly frequent. The potential for random violence requires each of us to be keenly vigilant at all times. Health-care institutions, as well as corporations, must care for the needs of their patients and employees and dial into the challenges or stressors that may be affecting their home life or their loved ones. Second, we must recognize the immediate impact and stress on our employees when these situations occur — even when they happen elsewhere. In hospitals, providing patient care is stressful enough. Show compassion and open up a safe environment where employees can meet with leaders to share their concerns and suggestions. Remind staff about your employee assistance programs, if you have them. Listen and demonstrate that you are taking action to further enhance security, if needed. Third, when directly impacted, host extensive post-event debriefings to evaluate what occurred and analyze your response to the shooting. Our staff immediately rounded on our patient units to communicate a message of stability during a time of uncertainty. I’m proud to say that not one patient chose to leave our facilities after these shootings. Fourth, communicate steps you’ve taken and your progress. This could be enhancements to security or physical changes to areas impacted by the event. On the latter, the goal there is obvious: to create a sense of a new space. The horror experienced during an active shooting is one that is hard to forget. The feelings, the sounds, the decisions, and more will all be memories that stay with you throughout your life. While OK to remember, it is important to not let the experience define you or your organization. Time is the ultimate healer. It has allowed us to reflect on and learn from these tragedies. “See something, say something” isn’t just a platitude to be posted on a break room bulletin board. All of us must be attuned to behavioral cues of our employees and patients and react confidently and professionally should the unspeakable happen. I hope to never experience another act of violence in our facilities, but as a realist, I know that being prepared and having a well-coordinated plan is the only way to mitigate harm to our patients and employees. As leaders, we do what we do, so our health-care teams can safely do what they do – save lives. Joseph W. Devine is president of Jefferson Health — New Jersey.